Did Elvis Fake His Death? It cannot be denied that because of his incredible popularity, Elvis had become a prisoner in his own home. At times, when he wanted to leave Graceland, he would send out decoys, men who somewhat resembled him, to distract fans and those who went so far as to follow his car. He had also been known to hide in someone else’s car – some say in the trunk – in order to avoid detection. On one occasion in Las Vegas, he became ill and so many fans and paparazzi followed his vehicle and surrounded the hospital, he was unable to receive proper medical attention. There has long been a rumor that on the day before Elvis died, August 15, 1977, he traveled to a courthouse in downtown Memphis and allegedly spoke before a grand jury, however, the conversation was not recorded. Considering he died less than 24 hours later, it is strange that no one seems to know what he said, or why he was called to testify. Conspiracy theorists wonder if instead of an appearance before a grand jury, the meeting downtown was actually a high-level Black Ops meeting to discuss the King’s upcoming demise. Elvis did, indeed, receive death threats and some believe he faked his death for safety reasons. But almost all celebrities receive death threats and they don’t pretend to die. However, in a Commercial Appeal editorial, it was claimed he arose late, as usual, Monday, August 15, and after sundown, took one of his Stutz-Bearcats out for a drive around Memphis before returning to Graceland to play racquet ball. But regardless of what he did the day before his death, if for some reason he did decide to disappear, he certainly had the wherewithal to do so. Conspiracy theorists cite the fact that in addition to a mysterious withdrawal of more than $1 million from one of his checking accounts, several of the King’s prized possessions disappeared after his death, including a family Bible, a significant amount of jewelry, photographs of his mother and several of his most cherished books, and these items have never been recovered. Nevertheless, Elvis did some strange things during the weeks preceding his death. 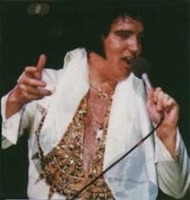 Although he was scheduled to embark on an extensive concert tour, apparently, he failed to order any new costumes despite having put on an extra 50 pounds since June 26, the date of his last concert (above) in Indianapolis, during which he introduced numerous members of his entourage on stage. He had never done this before and in retrospect, it seemed to some he was saying his final farewell. He also signed a lucrative deal with NBC, which was going to cover the tour. Many were surprised because Elvis, although grossly overweight, was still vain about his appearance. Was it because he knew there would be no appearances? He also fired several longtime employees and on August 14, the anniversary of his mother’s death, is said to have telephoned a Miss Foster and told her the upcoming tour wasn’t going to take place. She asked if he had canceled it and he said no and that she shouldn’t ask any more questions, tell anyone what he said and not to believe anything she read. Allegedly, he told her his troubles would soon be over and he would call her in a few weeks. One author wrote that “Miss Foster” took a polygraph test regarding her assertions and passed. Then there’s the mysterious John Burroughs. Shortly after Elvis died, a man who bore an uncanny resemblance to the King boarded a plane for Buenos Aires. And the following day, Lucy De Barbon, a friend and former lover, received a single rose with a card from “El Lancelot.” This, it turned out, was her pet name for Elvis, something she swore no one else knew. Conspiracy theorists cite various clues to prove Elvis didn’t die August 16, 1977, including the date itself. Elvis was fascinated by numerology and one of his favorite books was Chiro’s Book of Numbers. The date he chose for his death was 8-16-1977 and when these numbers are added, the sum is 2001. Elvis’ favorite movie was 2001: A Space Odyssey, in which the hero plans for immortality while in the bathroom. Elvis, because of his chronic constipation, spent so much time in the bathroom that he had the toilet modified so he could recline while sitting on the john. The King was also a devout Christian and the number 3, representing the Father, Son and Holy Ghost, was paramount to his beliefs. When the digits in 2001 are added, the result is 3. Some have taken it even farther and discovered the repetition of the number “24.” When one subtracts 1977 (the year of his death) from 2001 (his favorite film), the sum is 24. The month and day of his death – 8 and 16 – also add up to 24, and the numerals in the year 1977 equal 24. Thus, there are 3 occurrences of the number 24, and 24 is equally divisible by 3: 24 ÷ 3 = 8, and 8 has a perfect cubed root: 2x2x2 = 8. When one considers the numerical significance of the date of his death, it becomes clear that if he, indeed, faked his death, he couldn’t have chosen a more appropriate date. Another of Elvis’ favorite books was Autobiography of a Yogi, which teaches that everything is comprised of energy and light and perceived limitations are nothing more than illusions. One of the central themes concerns relinquishing one’s wealth and worldly possessions to achieve spiritual oneness. Was Elvis so intent upon uniting with the spirit that he faked his own death to live in virtual exile? But what about all those drugs? There has been so much written about his addiction to prescription drugs that the very name “Elvis” and “drugs” have become almost synonymous. But Elvis was an expert when it came to pharmaceuticals. He owned and read numerous books on drugs and knew the effects and side effects of all the medications he took. In fact, his knowledge of drugs was such that he could have easily faked his own death. He knew which drugs would slow the heart to a near deathlike state. Furthermore, he was an expert in the martial arts and knew how to slow his heart rate and respirations in order to feign death. Okay, this is farfetched, but it could have happened. At age 42, Elvis realized he was nearing the end of his career. His natural hair was greying, he was morbidly obese and his voice had weakened to the point he could no longer sing the high notes of his youth. Other than his millions of dollars and numerous possessions, just about the only thing he had left was his pride and he didn’t want his fans to see him as a worn-out old man they pitied. He was also fascinated by death and was known to visit local funeral homes at night and on at least one occasion, requested that he be allowed to observe the embalming of an elderly man he knew. On another occasion, it is said, he planned a “death” in which someone would fire blanks at him and he would fall and discharge a “blood pack” to see how those closest to him would react. To many, the foregoing makes a compelling case for the King’s planned demise, but there’s something else: his medical condition, specifically his bowel problems. From the beginning there were rumors Elvis, who suffered from chronic constipation, died because his intense straining on the toilet brought on a heart attack. Later, his personal physician, George Nichopolous, M.D., admitted Elvis had what is commonly known as bowel paralysis, a hereditary condition which also affected his mother. At that time, the only treatment for the malady was colostomy and Elvis was much too vain to let it be known he had to wear a colostomy bag. But what if the pain, discomfort, bloating and “accidents” became too much to bear? What if he finally admitted to himself he could no longer live at all unless he submitted to the surgical procedure and chose to disappear for good to have the operation as a private citizen rather than let his fans know he was reduced to wearing a smelly, waste-collecting pouch? Sources: The Memphis Commercial Appeal, Xaviant Haze, Daily Mad Talk, The Indianapolis Star, and Rebecca Stone, ElvisForever. This is the first time that I've heard that he could have faked his own death to have the operation for his bowel problem. That actually makes sense because wearing a colostomy bag would have destroyed his image and think of all the jokes that would have been made about it and even Saturday Night Live skits. He couldn't have taken that. I agree, Pat. If he had just wanted to get away from people, or if he was afraid for his life, he could have bought an island somewhere, but the bowel thing I can understand. I would think that the doctors would have had a difficult time doing a colostomy on Elvis, considering the size of his colon and the amount of impaction. The autopsy said that he had around 9 feet of feces in his colon that had the consistency of clay that had been there for 4 or 5 months. I'm surprised that he lived as long as he did because I would think something like that would have poisoned his entire system. People can have parts of their intestines surgically removed, but with bowel paralysis, such as what Elvis had, I'm not sure that would work. I'm sure there are ways of surgically getting rid of the impaction, but if the intestines weren't working, even if the impaction was removed, the same thing would happen again. As fans gather in Memphis for their annual pilgrimage to Graceland, the entire spectacle is becoming ever more bewildering to generations of young people who weren’t around when “Elvis left the building” on that hot August afternoon almost 40 years ago today. For those of us who were around, the shocking demise of the King of Rock ’n’ Roll at just 42 remains a defining moment in music history. It’s true – you either “got” Elvis Presley or you didn’t. I can recall an acquaintance inquiring derisively after listening to one of the King’s extraordinary covers: “Is that all Elvis did was sing songs written by other people?” I explained that it was all anyone did – Sinatra, Bennett, Martin – before the Beatles came along. But, I was quick to add, few did it better. Patriotism notwithstanding, by most accounts Elvis disliked the army. Fortunately for his career, RCA Records had a stockpile of recordings ready to turn into hits while he was serving in Germany. Unfortunately for his personal life, it was in the service, while battling severe insomnia, that Presley started down the road to drug dependency that would eventually consume him. Yes, critics to this day point to the paradox of the would-be FBI narcotics informant strung out on prescription drugs; of the religious Southern gentleman raised to love his mother cursing on stage and womanizing off it, and of the entertainment role model posing with President Richard Nixon whose inexplicable lifestyle would ultimately lead to his ignominious death on a bathroom floor in Graceland. But it’s worth remembering there have always been two types of sinners: those whose image says one thing while they do another – of which Elvis was at least subconsciously guilty – and those who deny the reality of sin as a convenient way of justifying their own wayward impulses. Both are equally hypocritical. Yet for all of Presley’s self-induced troubles, none compares with the litany of physical ailments that left the singer in near-constant pain. Records show that he suffered from asthma, atherosclerosis, diabetes, gastric ulcers, a mega-colon, glaucoma, lumbar disc protrusion, jaundice, prostatitis, vertigo, fatty liver, emphysema, anemia, migraines, chronic hepatitis, and cardiovascular disease. Whether the King died of a cardiac arrhythmia due to an enlarged heart (the official story), an acute drug overdose (which is doubtful given how quickly he died) or even “chronic constipation” (as his controversial personal physician, “Dr. Nick,” contends) from a colon twice the size of the average adult – it has all, at one time or another, been fodder for the cynics. Right up until you consider that the singer’s trauma was apparently so severe that he “constantly complained of aches and pains on stage and off. 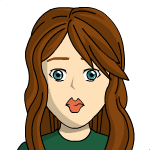 Elvis was heard to say on many occasions, “Oh, God, I hurt,” according to Dr. Forest Tennant, a pain-management specialist who theorized that Presley suffered for years with a serious autoimmune disorder. He also suffered greatly from an almost palpable case of career mismanagement by Col. Tom Parker. For some inexplicable (if not nefarious) reason, Elvis was never allowed to perform overseas – thus forgoing a lucrative market of millions of dollars. Moreover, it’s been widely reported that Barbra Streisand wanted Presley for the male lead in 1976’s greatly anticipated remake of A Star is Born – but Parker nixed it even though he had consigned Elvis to a string of formulaic movies beforehand. Nevertheless, Presley’s uncanny ability to rise to the occasion continued to propel his career. 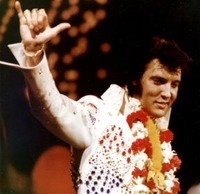 His sold-out performances at Madison Square Garden in the summer of 1972 set records, and his January 1973 Aloha from Hawaii concert (the first delivered “live” via worldwide satellite) was notable on several fronts. Esposito divulged that Presley actually let his “Memphis Mafia” pick the playlist – which differed significantly from his extant tour set. Even more revealing, because of the satellite’s “window” (after which the broadcast immediately goes “dark’), Elvis had to deliver the show exactly on time to the second. As Esposito remarked: “He nailed it – never missing a beat,” and the show turned out to be the apex of one of entertainment’s most enduring musical comebacks. Of all the creative arts, music is surely the most evocative – which helps explain the connection Elvis still has today. But only partly. Perhaps Presley continues to resonate, at least on a subconscious level, because after all these years, he remains the epitome of a classic American dream: a rags-to-riches hero whose life wasn’t nearly as easy as it looked. Source: Jason Lewis, The Minneapolis Star-Tribune, August 14, 2015. Lisa Marie led a candle light vigil at Graceland this year. Hundreds of people still show up at Graceland every year on his birthday and in August when he died. I may have asked this before in another thread, but something that I don't understand about Elvis getting so overweight is that the diet pills from back in the 60's and 70's could make you lose 20 pounds in a month, so why didn't he start taking them before he got so overweight that he had all of those health problems? He had doctors. Why didn't they prescribe the pills and have the nurse who worked for him see that he took them and didn't overeat? But if he was taking the pills, he wouldn't be able to overeat, so he must not have been taking them. There's a lot of unanswered questions about Elvis. Today would have been Elvis Presley’s 81st birthday and the United States is celebrating. Legacy Recordings is set to release a 60-CD box set of the King’s music, Graceland is due to auction off more than 100 Elvis items and Memphis is holding an Elvis Presley Day in memory of the rock ‘n’ roll legacy. Many of the events will be attended by impersonators, as the famous musician himself died August 16, 1977. Or, at least, that’s what they want you to think. Elvis Presley is the subject of multiple conspiracy theories, and there are people who insist he’s alive to this day. Cause of death. Elvis’s death was initially reported to be the result of a heart attack, but then some said it was an accidental drug overdose. Experts blamed cardiac arrhythmia, or an irregular heartbeat. David Stanley, his stepbrother, later said Elvis committed suicide. And then, in 2010, one of Elvis' doctors said untreated constipation killed him, according to unsolved. Autopsy. Elvis’s dad, Vernon Presley, ordered the artist’s autopsy and death certificate be immediately sealed. They are scheduled to become available to the public in 2027 – 50 years after his death, according to preslaw. The body. The National Enquirer published a photo of Elvis in his open casket, though many conspiracy theorists said a wax dummy took his place. Others swore the corpse was sweating. Gravestone. Elvis usually spelled his middle name “Aron,” but a copper plaque at his grave in Graceland spells it “Aaron.” A Graceland spokeswoman told the Associated Press in 1997 this was intentional and before his death, Elvis told his family he wanted it spelled “the way it is in the Bible” – with two A’s. Sightings. In 1988, a woman in Vicksburg, Michigan, started telling people she’d seen Elvis at the grocery store. After hearing a similar story, the Elvis Sighting Society in Ottawa, Ontario, established an Elvis Lives Lane. There have also been suspicious photos like the pool door picture, which appears to show Elvis at Graceland months after his death, according to whatculture. Amid all this discussion, however, there have been several reports assuring Elvis fans the King is actually dead. Why do we keep holding on? According to a 2015 story in the Atlantic, it’s because Americans aren’t quite ready to let him go. Source: Julia Glum, International Business Times, January 8, 2016. Cause of death. Elvis's death was initially reported to be the result of a heart attack, but then some said it was an accidental drug overdose. Experts blamed cardiac arrhythmia, or an irregular heartbeat. David Stanley, his stepbrother, later said Elvis committed suicide. And then, in 2010, one of Elvis' doctors said untreated constipation killed him, according to unsolved. I thought that it was pretty much settled that he died of a heart attack, probably brought on by his impacted bowels. Also, if his bowel impaction could have caused his entire system to be poisoned, that would have caused what is called septicemia and I think that septicemia can cause a heart attack. What I don't understand is why his doctors didn't know that he had all this infection, or whatever it is, in his blood. Aren't there tests that can detect septicemia? A lot of people want to blame the diet pills or amphetamines that he was taking, if he was taking them, but a person that overweight certainly isn't taking amphetamines. I don't know much about what drugs could cause his bowels to become impacted like they were, but from what I've read, diet pills don't cause it, but drugs containing opium do, so if it wasn't hereditary and drugs had anything to do with it, it was probably because he had been taking huge amounts of pain killers for several years. I think that what he had was hereditary and he got it from his mother, who was in her 40's when she died. I've heard that his mother was taking diet pills and some people try to say that's one of the things that caused her death, but she was overweight and if they were amphetamines, she would have lost weight, if she took them. Opiates do cause constipation and I've known some people who have had serious problems with constipation just from taking codeine. Elvis had been taking them for years and he already had a bowel problem, so the opiates just made things worse. I kind of doubt that he had septicemia. He died sitting on the toilet trying to go to the bathroom and I've heard of other people dying that way. Something that puzzles me is the way his body looked in his casket. He looked like he did years before. There's a limit to what undertakers can do and they can't make a fat and bloated old man look young again. The call came to Memphis Fire Station No. 29 at 2:33 p.m., Tuesday, August 16, 1977. The dispatcher indicated that someone at 3754 Elvis Presley Boulevard was having difficulty breathing. “Go to the front gate and go to the front of the mansion,” the voice directed. Ambulance Unit No. 6 swung out of the station onto Elvis Presley Boulevard and headed south, siren wailing, advertising a speed that the ponderous machine had not yet achieved. On this run, Crosby was driving the ambulance. He was thirty-eight, stoutly built, dark-haired, and heavily mustached. His partner, Ulysses Jones, twenty-six, sat in the passenger seat. Members of the Memphis Fire Department, they had received eighty-eight hours of special training to become emergency medical technicians and had years of experience. On each call, they alternated between driving and riding in the back with the ill or injured. This time, Ulysses Jones would ride with the patient. Crosby expertly threaded the boxy white, blue and orange vehicle through the thin mid-afternoon traffic with lights flashing. Heat waves shimmered up from the asphalt in front of him. During the day, the mercury had risen into the mid-90s and hovered there. In a city not yet fully air-conditioned, many working Memphians breathed the hot, damp air, mopped their brows and thought fondly about getting home to an icy drink on their shady screened-in porches. Dr. ‘Nick.’ Four years later it would be established in court that during the seven and a half months preceding Elvis’s death, from January 1, 1977, to August 16, 1977, Dr. Nichopoulos had written prescriptions for him for at least 8,805 pills, tablets, vials and injectables. Going back to January 1975, the count was 19,012. The numbers defied belief, but they came from an experienced team of investigators who visited 153 pharmacies and spent 1,090 hours going through 6,570,175 prescriptions and then, with the aid of two secretaries, spent another 1,120 hours organizing the evidence. The drugs included uppers, downers and powerful painkillers such as Dilaudid, Quaalude, Percodan, Demerol and cocaine hydrochloride in quantities more appropriate for those terminally ill with cancer. In fact, around 2:00 a.m. on the morning of his death, Dr. Nick was again ready to prescribe. He responded to a telephone call from Elvis by prescribing six doses of Dilaudid, an opiate that was Elvis’s favorite drug. One of Elvis’s bodyguards, Billy Stanley, drove over to Baptist Memorial Hospital, picked up the pills at the all-night pharmacy and brought them to Graceland. The bodyguard said he saw Elvis take the pills. The autopsy, however, showed no traces of Dilaudid in Elvis’s body. In the fall of 1981, the state tried Dr. Nichopoulos in criminal court for overprescribing drugs to Elvis and a number of other patients. Dr. Nick testified that if he had not given Elvis a large proportion of the drugs he demanded, other doctors would have. By supplying Elvis, he had at least some control over his patient’s intake. His defense was weakened substantially by evidence that he had prescribed an excessive amount of drugs to at least ten other patients, including rock star Jerry Lee Lewis and his own teenage daughter, Chrissy. On the other hand, it was clearly established that Elvis could, would and did get any drug he wanted from show business doctors in Las Vegas and Los Angeles. One of his suppliers was a Las Vegas physician called “Flash” by Elvis’s staff, because he would appear on a moment’s notice, syringe in hand, ready to inject Elvis with whatever drug he wanted. The guys said “Flash liked to attend Elvis’s parties to mix with the overflow of attractive young women present and perhaps find a companion for the evening.” At home in Memphis, Elvis would get packages containing drugs mailed from the West. Sometimes he sent his private plane, the four-engine Lisa Marie, to Las Vegas or Los Angeles to secure drugs from doctors in those cities and ferry them back to Memphis. Sometimes he flew out himself. Dr. Nick, like Elvis’s other physicians, had been seduced by the frothy glitter of show business, and with his tanned and striking appearance he fit right in. His style diverged from the practice of medicine that was increasingly a matter of business and less a matter of personal service. He was born and reared in Anniston, Alabama, where his father was a highly respected restaurant owner and businessman. George Nichopoulos, however, had not at first been a high achiever. He had not progressed smoothly through college and medical school. He had first entered the University of Alabama on a football scholarship, but dropped out before the school year ended, and he served in the army for two years. He was a student at Birmingham Southern University for a year and then moved on to the University of the South at Sewanee, where he earned his Bachelor of Science degree in 1951. He worked in a research lab at Vanderbilt University before his admission to medical school in 1952. He failed biochemistry and physiology, was put on probation, and tried to make up for his failures during summer school, but failed again. In the fall, he was not readmitted. He moved to Memphis and for three years worked in the University of Tennessee’s medical school. In 1956, he was readmitted to Vanderbilt Medical School, graduating in 1959. After finishing his training, in 1962, he entered practice in Memphis with several doctors who called themselves the Medical Group. Other doctors looked askance at George Nichopoulos’s personal and sartorial style. Too much informality, they thought. He allowed his patients, friends and acquaintances to call him “Dr. Nick.” He seemed unduly proud of the stylishly arranged thatch of white hair that crowned his head and he was not averse to revealing his chest hair. He often wore his shirts open at the throat, showing off a very large, tasteless gold medallion suspended by a necklace and resting against his bare chest. The medallion was a special gift from Elvis Presley and marked him as a member of the star’s inner circle, some of whom were macho young men who proudly called themselves “the Memphis Mafia.” Dr. Nick usually sported a highly visible array of expensive rings, bracelets and wristwatches, some of which were gifts from Elvis. Without his white smock and dangling stethoscope, one would have difficulty recognizing him as a doctor, even in a medical office or hospital. How could he command sufficient authority among his patients? his medical colleagues wondered. How could he justify his fees? Dr. Nichopoulos was making his rounds at Doctors Hospital far out on the east side of Memphis when the call came that Elvis was in trouble. Dropping everything, he rushed to Graceland in the green Mercedes-Benz Elvis had given him. He was taken by surprise by the call. He had done everything he could think of to preserve Elvis’s life in the face of his drug addiction and he thought he was succeeding. He was looking forward to flying off in the Lisa Marie with Elvis to Portland, Maine, for a ten-day tour. For years the doctor had often toured with Elvis, carrying all the necessary drugs with him. Elvis would sometimes introduce him to his adoring audiences, publicly expressing his fond appreciation for his physician as thousands of people looked on and Dr. Nichopoulos stood in the spotlight graciously accepting their applause. Now and again, when Elvis was mad at Dr. Nick, he would punish him by not letting him come along on a tour. The day before Elvis died, Dr. Nick had loaded up his bag at the Prescription House, a pharmacy just across the street from his office. Later, investigators found that for this ten-day trip, Dr. Nick had picked up 682 pills and tablets, including Dilaudids, Percodans, Amytals, Quaaludes, Dexadrines and Bephetamines, along with 20 cc’s of liquid Dilaudid. The material benefits that Dr. Nichopoulos enjoyed from his association with Elvis did not stop at gifts and fees. In 1975, he had persuaded Elvis to loan him $200,000 to build a house in a newly developing and affluent neighborhood well east of town. With a tennis court, a swimming pool, and an enclosed racquetball court, the banks found the home too costly even for its well-to-do neighborhood and refused to lend Dr. Nick the money he needed. Elvis did so, and before he passed away, $55,000 more. They did draw up a paper shortly before Elvis’s death that would pool the loans and obligate Nichopoulos to repay the amount over a period of twenty-five years at 7 percent interest, but Elvis never got around to signing the document. Only days after the funeral, Vernon summoned Nichopoulos to Graceland and with insulting haste, compelled him to sign a document in which he mortgaged his home to Elvis’s estate for the total amount he owed. He also increased the interest rate to 8 percent and warned Nichopoulos that if he was late on even one month’s payment, foreclosure would summarily follow. Vernon had never trusted Dr. Nick. Court records indicate that as of June 27, 1979, Nichopoulos had not missed a single payment and still owed the estate $245,807.33. Baptist Memorial Hospital. The ambulance left Graceland at 2:48, sixteen minutes after it arrived. At 2:56, it pulled up at the emergency room at Baptist Memorial Hospital. The hospital maintained a superbly well trained crew of eighteen doctors, nurses and medical specialists to deal with life-or-death situations. Dubbed the Harvey Team, it could gather at a given point in the building within minutes after the alert was sounded. Already assembled and waiting when this patient arrived, the team rushed him into Emergency Room B and went to work. They had not been officially told that it was Elvis. “Why are we working on this guy?” asked one young medic, seeing that he was already dead. “Because he’s Elvis Presley,” answered one of her older teammates. At Graceland, Nichopoulos secured Vernon Presley’s signature to a document authorizing an autopsy of his son’s body by the staff of Baptist Hospital, to be paid for by the Presley estate. Thus, Vernon might share – or not share – the resulting report with anyone he chose. If the object was to keep the cause of Elvis’s death a secret, it was an excellent move both for the Presley family and for Dr. Nichopoulos. If Elvis died by his own hand from popping too many pills, only trusted people needed to know the truth, and the carefully constructed public image of Elvis would be secure. Also, if Dr. Nichopoulos had prescribed too many pills for Elvis, that fact might be kept from authorities who might otherwise take away his medical license or even bring him up on criminal charges. The Cover-Up. Baptist Hospital administrators realized that in dealing with the death of Elvis Presley they were involved in a public relations matter that might damage the hospital’s sterling reputation. Over the years they had carefully concealed the nature and seriousness of his often embarrassing illnesses, including those resulting from drug abuse. Dr. Nichopoulos had always checked Elvis into Baptist Hospital because he knew they were discreet. That was surely one reason why he ordered Charles Crosby to drive the ambulance some seven miles to Baptist Hospital rather than to the nearest emergency room, at Methodist South Hospital, only blocks away from Graceland. Early on, a meticulous dissection of the body revealed what Elvis did not die from. It was not heart failure, stroke, cancer, or lung disease – the usual killers. It also confirmed what his doctors already knew: Elvis was chronically ill with diabetes, glaucoma and constipation. As they proceeded, the doctors saw evidence that his body had been wracked over a span of years by a large and constant stream of drugs. They had also studied his hospital records, which included two admissions for drug detoxification and methadone treatments. Over time, Elvis had, in effect, been poisoned. The bloated body, the puffy eyelids and the constipation reflected the slow death. They prepared multiple specimens from the corpse’s fluids and organs to be identified anonymously and sent to several well-respected laboratories across America for analysis. Chances seemed high that Elvis had, in fact, overdosed. Dr. Francisco seemed uninterested in Warlick’s findings. He smoked a cigarette while Warlick talked. In front of them, the hospital pathologists continued to dissect Elvis’s body, piece by piece, on a porcelain table. Francisco cut Warlick off before he had finished his report, but invited him to stay and witness the autopsy. The Shelby County medical examiner, perhaps, had already decided what the official cause of death would be. Francisco and the hospital authorities knew that the world was waiting for their announcement about what killed Elvis Presley. News people were swarming around inside and outside of the hospital. Maurice Elliott, the hospital’s vice president, knew that he had to give the journalists something to report. After Elvis’s body had been wheeled away to the morgue, he told them that Elvis had been pronounced dead at 3:30 p.m., apparently of heart failure. He also scheduled a press conference with the pathologists for 8:00 p.m. As that hour approached, the pathologists were still working on the body and realized that they could not say with scientific certainty what had killed this man. They knew that he did not die of the usual causes, and they knew that addiction to drugs was the probable cause, but they could say nothing with confidence until they got the results back from the laboratories, if then. That would be a matter of weeks. The press and the world were not likely to wait patiently for their verdict. At eight o’clock the hospital conference room was crowded with journalists when a team of doctors entered and took places behind tables in the front of the room. Dr. Francisco made himself the spokesman for the physicians. He sat down in front of a bank of microphones, flanked by Dr. Nichopoulos, Dr. Muirhead and five other physicians. All the hospital doctors still wore their white smocks, while Dr. Nick sported an open-necked black silk shirt, diamond rings and gold jewelry. Dr. Muirhead thought Francisco would say they would need to study the lab results before they could complete the autopsy and offer their judgment. Instead, Francisco opened with the flat statement that “the results of the autopsy are that the cause of death is cardiac arrhythmia due to undetermined heartbeat.” Muirhead could not believe his ears. Francisco had not only presumed to speak for the hospital’s team of pathologists, he had announced a conclusion that they had not reached. He said that Elvis had simply died of heart failure. Francisco continued his indictment of Elvis’s heart. “There are several cardiovascular diseases that are known to be present,” he said. “One is a mild degree of hypertension that had been under treatment for some time, and that there was hardening of the arteries, the coronary arteries of the heart, known as coronary atherosclerosis.” During the autopsy, the doctors had decided these conditions were indeed present, but not involved in Elvis’s death. Francisco talked pointedly about the existence of these two conditions as if they were important, but he was also careful to indicate they were not serious. He wasn’t lying, but he really hadn’t said anything of substance either. If Francisco wanted the world to leap to the conclusion that Elvis died of a heart attack without his actually saying so, it was a brilliant presentation. The message was that Elvis’s physicians had been monitoring his heart closely for a substantial period of time and there had been no indication that heart failure would kill him. The press and soon the world understood that a prestigious team of pathologists had said that Elvis died of heart failure, suddenly and without warning. It was a crisis that could not have been avoided. No one was at fault in Elvis’s demise. Francisco properly cautioned that the final and official determination of the cause of death would take days or weeks. Indeed, he warned, the cause “may never be discovered.” Nevertheless, he proceeded to announce that he was absolutely certain of one thing: it was not drugs. Elvis was taking medication for high blood pressure and his colon problem, he said, but “there is no evidence of any chronic abuse of drugs, whatsoever.” Again, Dr. Francisco was marvelously ingenious in his use of language. If he referred only to street drugs, he was correct. If he meant to include prescription drugs, he was lying. Dr. Muirhead was sorely embarrassed for himself, his staff of pathologists and his hospital. He later said he wished he had spoken up, but did not because he did not know what the laboratory reports would show. Even later, he was silenced by the fact the autopsy report belonged to Elvis’s estate, not to the state, and hence was not public knowledge. During the press conference, Dr. Francisco did not invite Dr. Muirhead or any of the other pathologists to speak after he finished, but rather turned the microphone directly over to Dr. Nichopoulos. Dr. Nick seemed “positively jubilant” over the medical examiner’s pronouncement that drugs were in no way involved and, in effect, no one was responsible for Elvis’s death. He told the journalists that he had been Elvis’s private physician for a decade and he knew positively that he had not been taking hard drugs. “If he was taking cocaine,” he declared, “I would have known about it.” He had given Elvis a complete physical only five days before, he said. “He was getting over an eye infection and a sore throat, but overall he was a healthy man.” Elvis’s death was simply a bolt out of the blue, a tragedy that no one could have prevented. Source: Joel Williamson, Salon, November 16, 2014. Note: As aforestated, this is an excerpt from a book and as such, the conclusions and opinions are those of the author. It sounds like that author had already decided that drugs killed him, so that was his conclusion. Dr. Nick was right when he said that if he didn't give him the drugs, he would get them somewhere else. I don't think that he or the other doctors knew that his bowel problem was as bad as it was because if they had known, they would have tried to do something about it.